South Meadow #152 Charming Cabin in Prime Location Close to Pools! 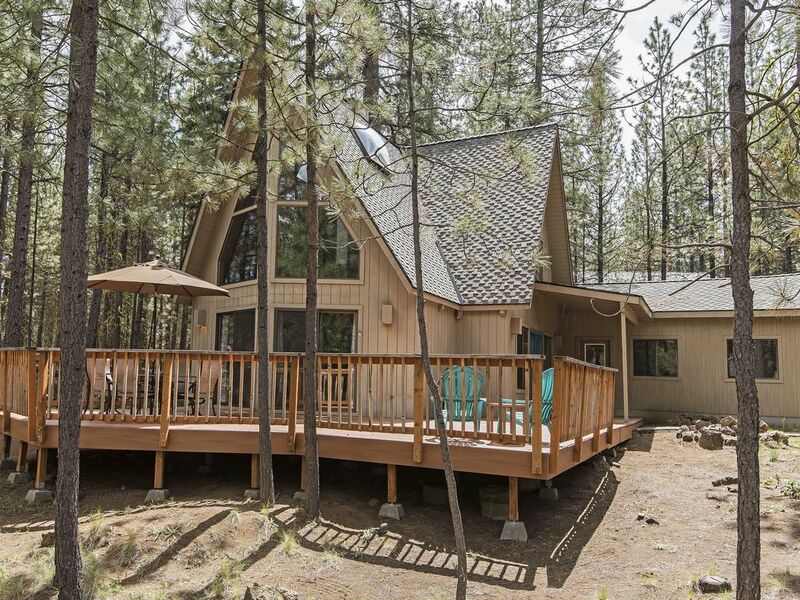 This adorable A-frame style cabin will provide an affordable and wonderful place for you to spend your vacation at Black Butte Ranch. This vacation rental has miles of windows, open beams, a beautiful large Trex deck and beautiful river rock fireplace. The home is a spacious 1,152 square feet (not counting the large family area in the garage). It is a wonderful home for a small family close to a bike path and recreation. You enter into the galley kitchen, which is fully equipped and conveniently open to the dining and living area. Eat in the designated dining room or dine on the outside deck. There is also a bar for extra seating. The living area has lots of floor to ceiling windows and a large river rock fireplace for those cool mountain evenings. One queen bedroom and full bath are off the living area. Upstairs there are two bedrooms, one with a queen and one with a double bed that has a open view to downstairs living area. A half bath is shared by both bedrooms. The garage has been converted into an extra bonus/play area. There is a large screen television with Wii, a game table, and lots of comfortable seating. This room will provide the adults and kids some separation when the kids would rather play video games or watch a movie and the adults are into their golf or football games. SM#152 is the perfect location, lying between the South Meadow Pool, a short distance north on the bike path and the Glaze Meadow Pool, a short distance to the south on the bike path. The terrain is nice and level so the little ones. This home is also dog friendly. The large Trex deck has ample room for all your evening BBQ's or to just sunbathe or relax with friends. You and the kids will want to return to this amazing vacation cabin year after year! There is a full bathroom downstairs plus a 1/2 bathroom up. We had a great experience in this cozy little house. The converted garage was a great spot to hang out and watch tv. The dog basket was an awesome addition. We had a great time. Thank you!! While a good location, the rental is in need of some major updating. All of the electrical sockets are loose (nothing stays plugged in without jiggling the wires) and some don't work (floor socket behind the couch). The fireplace leaks smoke throughout the cabin if used. There is no heat in the main floor bathroom which is a real issue during the winter months. The house and location met all our needs. Close to 2 pools and Aspen Lake. We had temps in the 100s and the house cooled down nicely. We had an extended family vacation and this home was one of 3 houses we rented. Right off the bat, Howells Realty Group was awesome to work with and our rental seemed to become party central when we all got together throughout the week. The other 2 rentals were with other companies and they didn't have the same 5-star experience. Thank you! Cozy rental cabin with room for 6 people. Only one bathroom and was a bit small but met our needs. Fireplace was a perfect addition but a little too much smoke in the house.